Piso Gialia beach is one of the most crowded beaches on the island. It is relatively easy to access, from the road to Stenies and the stairs from the chapel of Agia Fotini. The route is beautiful, full of stone walls and trees. At Piso Gialia Beach there is thin sand, impressive rocks and shallow blue waters, offering comfortable swimming. The sea is filled with boats and jet skis, as well as young people, mainly swimmers. The seabed is clear, and it is worthwhile to carry masks and flippers to explore it, even from the surface. To the right side of Piso Gialia Beach, behind the rocks that everybody climbs to dive, is the beach of Gialia. There is a reason! Even though Piso Gialia Beach gathers people for its apparent natural causes, there is a reason to be packed. The Beach Bar is the reason that youngsters can’t stand not to visit each an every day. Everyone likes it for food, drink, coffee, and race to find a sunbed. 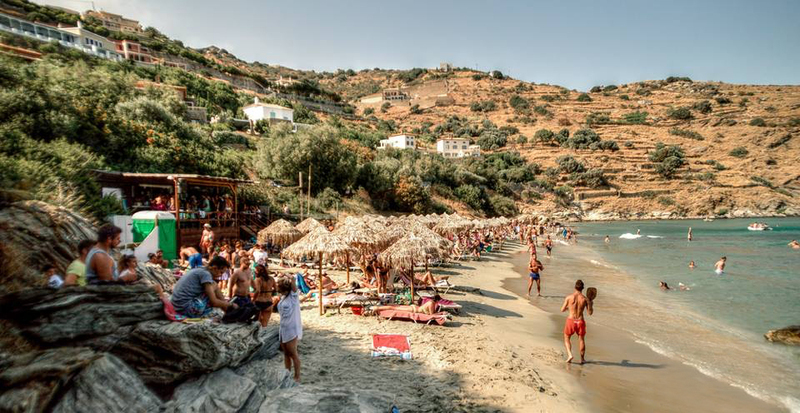 Quite often, a simple day that starts with a dive in the sea can end up in an overnight, wild beach party full of music and dancing.